"When I moved in there were giant holes and leaks in the walls and floors. There are also cockroaches and bedbugs. I asked Lockwood to make repairs and I never heard back," said Shawn Greeley, a tenant in a building at 32 Horton Street owned by Rick Lockwood. "I stopped paying rent because Lockwood was unresponsive and the apartment was in such bad condition. He then threatened to kill me. He actually said, 'I'll kill you.' Code enforcement visited my apartment but has not done anything to help. Lockwood recently shut off my power. This is wrong. It's just wrong." The report details major health, safety and livability concerns at properties owned by a web of shell corporations linked to Lockwood and two other landlords, Joe Dunne and Ted West. It was compiled from dozens of tenant interviews as well as an examination of code complaints and corporate records. "Unfortunately, residential property has not experienced the same renewal as other parts of our downtown. In fact, fires, foreclosures, and neglect have caused the area to be littered with abandoned and condemned properties and vacant lots," said MPA Lead Organizer Gen Lysen. "The actions of this small group of callous slumlords are dragging down the whole city. This is an issue that affects all residents of Lewiston, not just those forced to live in the deplorable conditions they have created." Sixty two percent of residents surveyed who live in the properties in question reported ongoing problems with pests, plumbing and safety issues. Their complaints were reinforced by code enforcement records showing the landlords in question to be serial violators. "The families who live here have not caused this. They aren't even victims of circumstance. They are victims of repeated exploitation and abuse from property owners," said Melissa Dunn, Tenant Rights Organizer for the Neighborhood Housing League. "Too often, those who speak out are retaliated against through the turning off of electricity, heat and hot water and through eviction. I commend the bravery of the tenants who are coming forward today and those who have added their voices to this survey and their names to this letter of complaint." "Lead paint and lead dust, exposure to excessive cold and damp, mold, and pests like bedbugs and rats all represent serious hazards to human health," explained Dr. Alice Haines, a family physician with a practice in downtown Lewiston. "Our whole community pays for those extra emergency visits, for those extra stays in the hospital, for those extra days in intensive care, and sometimes for years of disability from asthma or lung fibrosis." The three announced candidates for Mayor of Lewiston were invited to the event. Only Ben Chin, who also works as political director for MPA, chose to attend and speak. "The apartment smells of mold. There is mold in the walls, in the bathroom, and probably in the beams of the structure. I have lung problems and because of the mold I have contracted pneumonia since I moved in. This building is making me sick and if I hang around I'm going to die," said Elida Jones, who lives in a building managed by Joe Dunne. 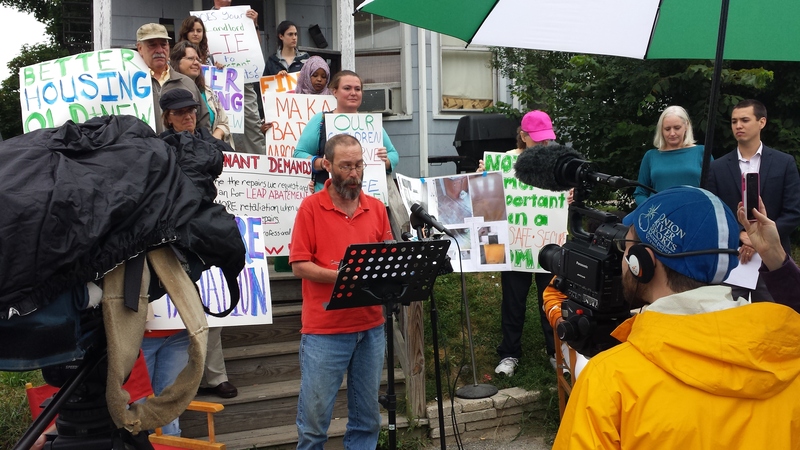 "We demand today that Joe Dunne, Rick Lockwood, and Ted West stop retaliating, start repairing, and reimbursing tenants for the repairs and pest abatement we've all had to do in their absence. And we ask that Code Enforcement follow-through in ensuring that these complaints are dealt with in a timely way." The report recommends municipal policy changes in three areas: greater transparency of violations and building ownership, tougher enforcement for serial violators, and increased city investment and involvement in support of ethical landlords.